"A Safer, Easier Way to Cut Food"
H.E.L.P. 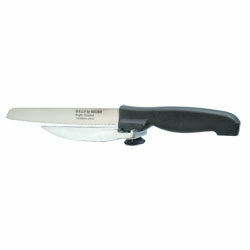 Magic Slicing Knife - Right Hand - Magic Slicing Knife with ergonomic handle for right-handed people with dexterity issues. This dexterity aid features a serrated stainless steel blade, with adjustable guide that makes it easier and safer to use. Measures 13 inches from blade tip to handle end. Serrated blade is 7-1/2 inches long.